A Black Necked Grebe at Shikabe this afternoon. Makes a bit of a change from Nuthatches. 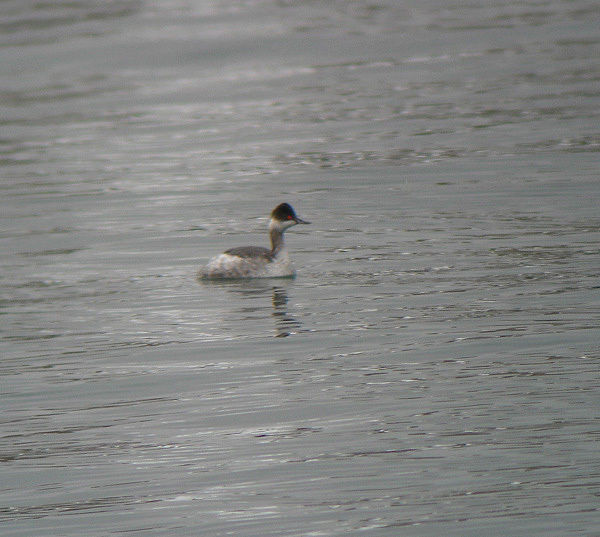 I saw all 5 species of Grebe in Japan today (the same 5 as in northern Europe in fact). They were all present at Kamiso this morning. Great Crested were even displaying. 4 Great White Egrets were standing shivering next to the river and lots of the usual Gulls and Ducks were around too. The above pic was taken in a fishing harbour in Shikabe. The harbour contained Goldeneye, Scaup, Red Breasted Merganser, Black Scoter and 5 Black Necked Grebe. It was extremely difficult to catch on camera and that was the best of a sorry collection. Digiscoping birds (in subzero weather) that dive every 3 or 4 seconds and can pop up anywhere is a test of chracter. An Ancient Murrelet at a different fishing harbour a couple of days ago. This was at Moheji which is about 15 minutes west of Kamiso (which is itself the westernmost part of Hakodate). It was less active than the Grebes but still tricky to photograph. 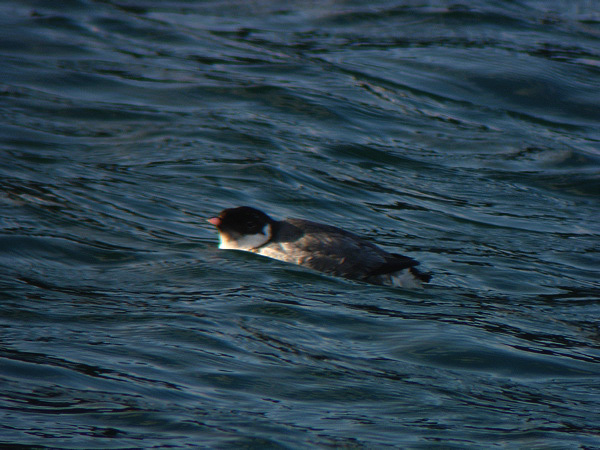 Only the 3rd Auk species I've seen around here. This particular harbour was pretty big and the Murrelet was right in the middle. Lots of Brent Goose and other common winter stuff were nearby but not in a place where we could stop. 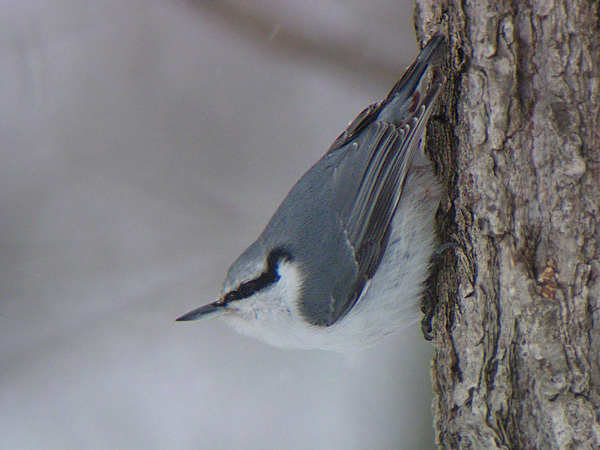 Finished the day at Onuma where I took yet more pics of the Nuthatches. At least this one was striking a slightly different pose. There had been heavy snow at Onuma since our last visit and it's now impossible to go into the forest without snowshoes (which is normal most winters anyway). More of the usual here. Buzzard, White Tailed Eagle and a female White Backed Woodpecker were the most interesting. The flock of Waxwing was a bit less restless on Friday. About 60-70 individuals. Mostly Japanese Waxwing with maybe 8-10 Bohemian Waxwing mixed in. I've been downloading a few movies recently (why doesn't my ancient i-mac have a DVD writer though!?!) and watched "Threads" last night. This is a TV movie from 1984 dealing with the effects of a Nuclear War on the UK. At the time I remember it being completely and utterly shocking. Last night was the first time I'd watched it since I was in 4th year (?) at Secondary School. The special effects and dialogue early on were a bit cheesy but the second half was as harrowing the second time, even watching it on a small computer screen with a bottle of whisky handy.